Marilyn Anderson has long been an active force in the musical environment of Ventura County as a versatile educator, director and performer. Anderson has been a member of the music faculty of California Lutheran University since 1992, teaching applied voice and other classes in the vocal curriculum in addition to appearing in recital and concert. She has appeared in several Festival of Scholars concerts, most recently collaborating with acclaimed composer Libby Larsen. A student of internationally known master teacher Elisabeth Parham, Anderson holds a Master’s degree in Vocal Performance from California State University, Northridge, with additional studies at the University of Southern California and the American Institute of Musical Studies in Graz, Austria. She has coached with Licia Albanese, George Shirley, Nico Castel, Joan Dorneman, and Curt Allen. She is a member of the National Association of Teachers of Singing and Pi Kappa Lambda Music Honorary. A dramatic coloratura soprano, Anderson’s performance credits include a wide variety of appearances in opera, oratorio, and musical theater including her recent critically acclaimed performance as the Mother Abbess in Cabrillo Music Theatre’s The Sound of Music for which she received the StageSceneLA award for Outstanding Performance-Featured Actor in a Musical. Operatic roles include The Queen of the Night (Die Zauberflote,) Rosalinda (Die Fledermaus,) The Mother (Amahl and the Night Visitors,) Mme. Silverklang (The Impresario,) and the Baroness in La Vie Parisienne, among others. 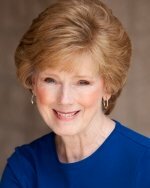 She has appeared as Fiona in Brigadoon, Marian Paroo in The Music Man, and also Elsa in The Sound of Music. In addition to recitals, she has been heard as soprano soloist in major oratorio works such as Mozart’s Requiem, Coronation Mass and Solemn Vespers, Handel’s Messiah, Poulenc’s Gloria, Brahms’ Requiem, Bach’s St. John Passion, Mendelssohn’s Elijah, Beethoven’s Chorale Fantasia, and Britten’s Ceremony of Carols. She has appeared with the Los Robles Master Chorale both locally and in Europe, the Moorpark Symphony Orchestra, the Conejo Symphony Orchestra, Los Angeles Music Theatre, and as soprano soloist in a televised performance of Haydn’s Orgelmesse in Graz, Austria. In the United States, she has a variety of television, film and recording credits. As the founding director of the long acclaimed Moorpark Music Theater, she has directed over 50 different works from opera, operetta, and musical theater. Students from this program have gone on to contracts with professional companies, both nationally and in Europe. She has received the Academic Senate President’s Award and the Outstanding Faculty Award. Works she has premiered include Siete Cancioncitas de Federico Garcia Lorca by Alan Hyams, Lines on Light by William Mayer, and Jeweled Settings, written for her by Eugene Bowen under a grant from the National Endowment for the Humanities.